We at RCBC Bankard Services Corporation (RBSC) respect and value your privacy. We believe that you are entitled to know how we use and protect your personal information. We give this notice to inform you of the ways in which we process your personal information and the means by which you can control, to a certain extent, these processes. While this notice is intended mainly for the benefit of our individual clients, we stress that we handle and protect the information of our entity clients in the same manner that we handle and protect the information of individuals. As the personal information controller under Republic Act No. 10173 or the Data Privacy Act of 2012, RBSC give this notice to inform you of your rights and our obligations under the law. Other information necessary to provide you with the product or service that you need. Over the course of our relationship, we may collect data about you including but not limited to your transactions, account history and information, inquiries about our products and services. Personal data that we collect as authorized or required by law. We may also collect information about you when required or authorized by law. For example, we require your personal data to verify your identity under Republic Act No. 9160 or the Anti-Money Laundering Act of 2001. RBSC uses “Google Analytics” to collect information about use of this site. Google Analytics collects information such as how often users visit this site, what pages they visit when they do so, and what other sites they used prior to coming to this site. We then use the information collected from Google Analytics only for purposes of improving this site. Google Analytics collects only the IP address assigned to you on the date you visit this site, rather than your name or other identifying information. RBSC does not combine information collected through the use of Google Analytics with any of your personally identifiable information. Please note that some information may be gathered with the use of ‘cookies’ which are small pieces of information stored on your browser that may be retrieved by the site. Although Google Analytics plants a permanent cookie on your web browser to identify you as a unique user the next time you visit this site, the cookie cannot be used by anyone but Google and will allow Google Analytics to recognize you on any return visit to this site. Should you wish to disable these cookies, you may do so by changing the appropriate settings on your web browser. We know that some of you like to engage with us through social media. So that we can respond to your inquiries, we may ask for your name, contact number and email address. We will only collect your information with your consent. For account and transaction inquiries, you can always call RCBC Bankard Customer Service. In applications, emails and letters, in customer surveys, during financial reviews and interviews. From data analysis (for example, the amount, frequency, location, origin, and recipient) of your payments and other transactions, and your use of our products and services. Information that we receive from our subsidiaries and affiliates, and from or through other organizations (for example, card associations, credit bureaus, insurance companies, and fraud prevention agencies) whether in the course of providing products and services to you or otherwise. How we collect and manage your sensitive personal information? TIN, SSS/GSIS no., health records, licenses, tax returns, etc. Unless allowed or required by law or regulation, we will only collect your sensitive information with your consent. When we receive your personal information, we will take reasonable steps to notify you on how and why we collected your information, who we may disclose it to and how you can access it, seek correction of it or file a complaint. This notice may already be included in the form or document that you filled out and submitted to us. When we receive your personal data from third parties, we will take reasonable steps to notify you of the circumstances of that collection upon your request. How do we take care of your personal data? Electronic security systems, such as firewalls and data encryption of our websites and mobile applications. We may store your personal data physically or electronically with third party data storage providers. When we do this, we use contractual arrangements to ensure those providers take appropriate measures to protect that information and restrict the uses to which they can put that information. We will only retain your information for as long as necessary for the purpose for which they were collected or as required by law and regulation. We will destroy your personal data when its retention is no longer required by purpose, law or regulation. To conduct our everyday business purposes (to process your transactions and maintain your account). Will we use your personal data for marketing our products and services? With your consent, we may use your personal data to let you know about products and services that we believe may be of interest to you, including products and services from our related companies. Such marketing activities may be via mail, telephone, SMS, email, or any other electronic means. We may also market our products to you through third party channels (such as social media sites), or via other companies who assist us to market our products and services. You can let us know at any time if you no longer wish to receive direct marketing offers. To comply with legal and regulatory mandates, we submit required information to government agencies, like the Bangko Sentral ng Pilipinas (BSP), Bureau of Internal Revenue (BIR), and Securities and Exchange Commission (SEC). Pursuant to Republic Act No. 9510 or the Credit Information System Act, we may disclose your personal and other relevant information to the Credit Information Corporation in connection with your application for and availment of a credit facility with us. This information may include data on your creditworthiness. With your permission, we may also share such information with other credit bureaus authorized by the Credit Information Corporation. Only after obtaining your consent, we may also disclose your information to third parties for marketing, cross-selling and other specified legitimate purposes. In instances where your information is shared with third parties, we will ensure that we would only share your data with entities that can demonstrate sufficient organizational, technical and physical security measures that can and will protect your personal data. How do you access or correct your personal data? Unless there are practical, contractual and legal reasons why we cannot process your request, you have the right to ask for a copy of any personal information we hold about you, as well as to ask for it to be corrected if you think it is wrong. To do so, please email dataprivacy@rcbcbankard.com. We care about what you think and we welcome your feedback. You can contact us thru RCBC Bankard Customer Service: +632 888-1-888. For your data privacy concerns and requests, you can email our Data Protection Officer at dataprivacy@rcbcbankard.com. 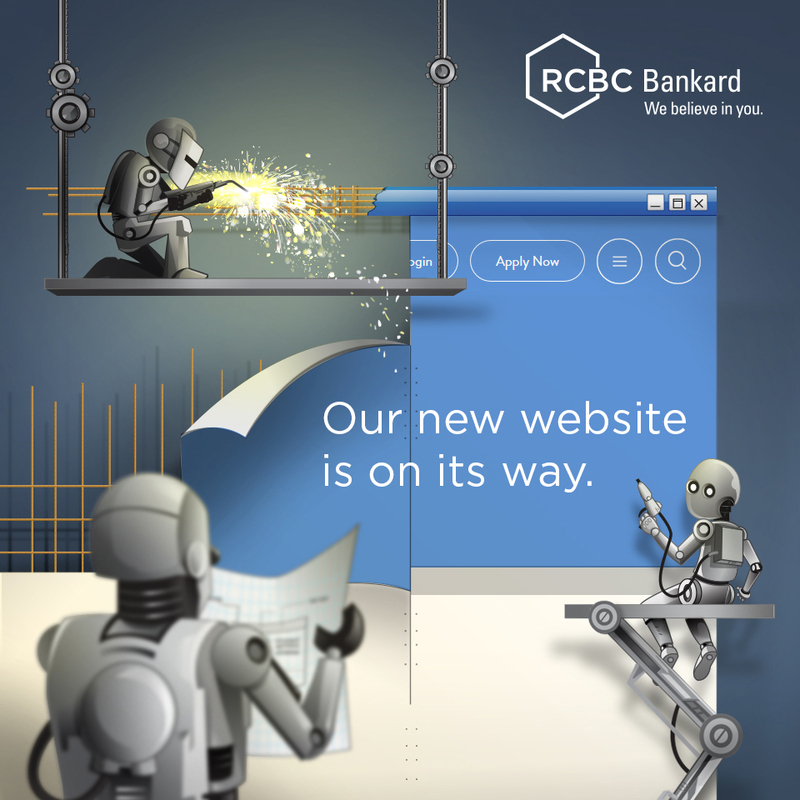 RCBC and RCBC Bankard Services Corporation are jointly committed to ensure the protection of your privacy every time you visit this website. Whether you are an existing customer or simply someone interested to know more about our products, we guarantee that your online security will be topmost in our minds. Unless we are required by law, we will keep in strictest confidence any information you may provide us. Rest assured we will only collect information that you submit to us voluntarily through our contact numbers and email address. This information will then be forwarded to the Customer Service Group for proper processing. Guaranteed Security. You have our assurance that any information you communicate to us is protected. Our system has put in place all the required technology to prevent unauthorized users from accessing our data. Inquiries sent through our website will be stored in a secured system environment. By their very nature, emails are never entirely safe. Thus, we will never include confidential account information via email. When necessary for the proper maintenance of your account, we will be asking a Customer Service Representative to get in touch with you directly. We will never ask for account numbers, passwords, credit card numbers or other personal information through email nor ask you to confirm any such information by clicking on a link in an email. Should you happen to receive an email containing a purported link to our website, asking you to provide or confirm confidential information, kindly ignore this and do not attempt to access the link to get to our site. Theselinks may be fraudulent and may link you to a spoofed site that could send all information you enter to the hacker who designed the site. Please be vigilant. Copyright © 2018. RCBC Bankard Services Corporation. All Rights Reserved.